Between November 1941 to October 1942 almost 25,000 Jews from the “Deutsche Reich” were deported to Riga. Thousands of them were shot on arrival. The remaining 22,000 were forced to live in the “Reichsjudenghetto”. However, before the “Reichsjuden” were deported to Riga, 27,000 Latvian Jewish inmates of the Riga ghetto were, over only two days, shot by the Nazis and willing Latvian collaborators, to make room for the new arrivals. It is seen as being one of the worst atrocities of the Holocaust. Those who survived the ghetto suffered for years after. 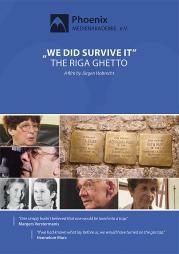 Only 1,073 survived the Riga Ghetto. In Hobrecht’s new film, German and Latvian survivors speak out for the first time about the massacre against the Latvian Jews, the living conditions in the ghetto and how they survived the trauma.